How did these clusters evolve over time? What did they look like billions of years ago? To answer these questions, astronomers look back in time to our youthful universe. Because light takes time to reach us, we can see very distant objects as they were in the past. For example, we are seeing the newfound galaxy cluster—called Massive Overdense Object (MOO) J1142+1527—as it existed 8.5 billion years ago, long before Earth formed. The W.M. Keck Observatories and Gemini Observatory on Mauna Kea in Hawaii were used to measure the distance to the cluster at 8.5 billion light-years. Using data from the Combined Array for Research in Millimeter-wave Astronomy (CARMA) telescopes near Owens Valley in California, the scientists were then able to determine that the cluster's mass is a quadrillion times that of our sun—making it the most massive known cluster that far back in space and time. "In the coming year, the team plans to sift through more than 1,700 additional galaxy cluster candidates with Spitzer, looking for biggest of the bunch." The conception of space and time in modern physics is wrong. This is why the idea of a Big Bang origin of the universe and other ideas are misconstrued. Please see the comments by "futurehuman" in the Guardian article at this link: http://www.thegua...of-time. 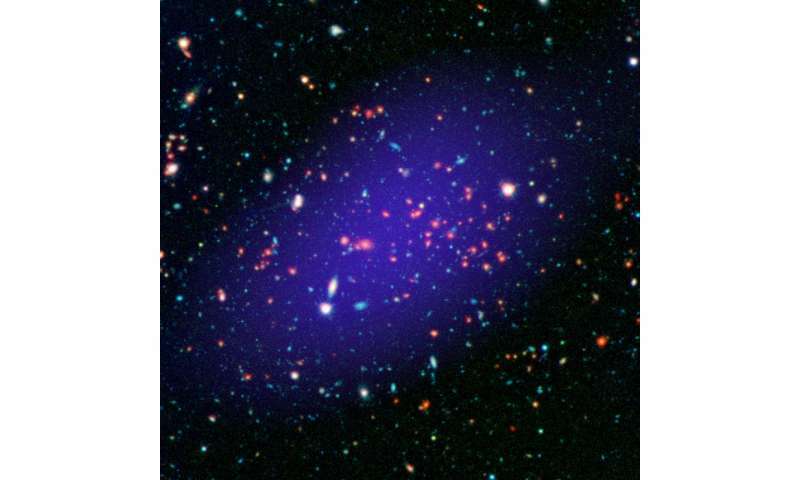 "Based on our understanding of how galaxy clusters grow from the very beginning of our universe, this cluster should be one of the five most massive in existence at that time,"
So what are they going to say when they have discovered 10 of these? Patch! So what are they going to say when they have discovered 10 of these? They will obviously say it should be one of the ten most massive in existence at that time.